It truly is with great excitement to announce the founding of a brand new virtual airline to serve the needs of our vast community. 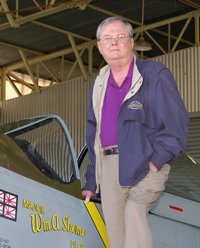 My name is Jerry Taylor and for over 30 years I’ve referred to myself as a virtual aviator. It all started for me back in the early 1980’s and the Commodore 64 flying around Meigs Field. As the years rolled along, so did the level of detail and excitement in more advanced simulations. What we have today, compared to what we had back in the 80’s is truly amazing. My first experience with a virtual airline came well before what we know about VA’s today. Way back in the 80’s, my friends and I would keep track of our flights on a legal pad (perhaps even a Big Chief tablet) and compare notes from time to time. My memories of these times were FUN! Of course, the dawn of the internet has helped to bring about a more social gathering of our like minded friends. I too remember the early days of internet based virtual airlines and the manual PIREP forms and the need of having to manually edit html pages to keep up with an active roster of pilots. Today we have a wide variety of ACARS applications and thankfully much of the day-to-day VA administration is automated. virtual Air Logistics (vAL) is a completely fictional airline. vAL is also simulating a new startup focusing on two areas of the United States. First, our HQ (and my home town) of Centennial, Colorado. KAPA is the perfect base to provide a unique and personal level of service to passenger customers and to our cargo customers. From KAPA we provide daily service throughout the Colorado Rocky Mountain region. vAL’s second focus area is from Anchorage, Alaska. The Alaska region provides a unique opportunity to those who enjoy Bush Pilot flying. Our company motto of “No runway too short. No airfield too remote.” Will serve to define how we operate as a virtual airline. As a VA simulating a fictional startup airline, we will gauge our development and fiscal health based on the overall membership growth and amount of flight activities from our members. In other words, as we gain members and as those members fly, vAL will expand with more routes and more aircraft. Speaking of aircraft, vAL currently uses the Cessna C208 Grand Caravan, Beechcraft B1900D and the Cessna C185F Float and Tundra versions. First rule at vAL is HAVE FUN! Fly the way you enjoy flying. Second rule at vAL is BE HONEST! Be Honest with vAL and most importantly, be honest with yourself. We don’t require online flights and we don’t require you to fly with our ACARs system. However, we expect honesty when it comes to filing PIREPs. If you didn’t spend the time to fly the route, then please don’t file the PIREP. I believe the enjoyment we receive from a hobby is equal to exactly what we put into it. Those who cheat will simply not enjoy the hobby and I believe in time they will leave. Our third rule, always be respectful. As we continue to grow and develop vAL, we may include a forum to ask questions, we may include a TeamSpeak server and we may also do some online events. My parents taught me in order to get respect, you must show respect. vAL does not have an age restriction. If you are old enough to fly a computer simulator (and have your parents’ permission), then you are welcome here at vAL. However, respect for others must always be followed. Our fourth rule, fly as much as you want and fly as frequently as you can. vAL exists to simulate a brand new startup airline. The more active pilots we have and the more flight time we accrue, the larger we can grow. However, any pilot who becomes inactive for 90 days and does not make contact with vAL management, may be removed from the roster. I think this is fair. We have routes requiring a time commitment of less than 30 minutes up to an hour or more. This should make it easy for those to maintain active status even with a hectic work/school/life schedule. Our fifth rule, we all start with zero hours and we all start at the rank of New Hire. Any pilot rank can fly any of the aircraft in our fleet. I believe this is a simple approach and I believe this will help with rule #2. In addition, vAL pilots may fly any route from any hub they choose. In closing, I would like to thank you for your time and if you feel virtual Air Logistics would be a VA you would enjoy flying for, please join. You’ll find our website at http://virtualairlogistics.org Our official grand opening date will occur on 1 June, but you are welcome to join and start flying today. Again, thank you for your time and happy flying!